We’d love your help. 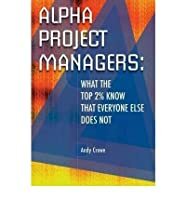 Let us know what’s wrong with this preview of Alpha Project Managers by Andy Crowe. To ask other readers questions about Alpha Project Managers, please sign up. Quick read, summarizes a study. Lots of useful best practices in here for managing projects. Relationship management, communicating effectively with stakeholders, a supportive organization and getting feedback are all critical to projects, and explored here. Crowe surveyed over 3,000 project managers and their co-workers/supervisors in order to identify the "top 2%" of project managers ("alpha project managers"). In the first cut he narrowed this down to 860 and finally identified the 2% or eighteen Alphas. He then attempted to discover what made these Alphas the absolute top of their profession. What can we learn from the Alphas in order to improve our performance? What are the things they do differently, more completely, or simply better? 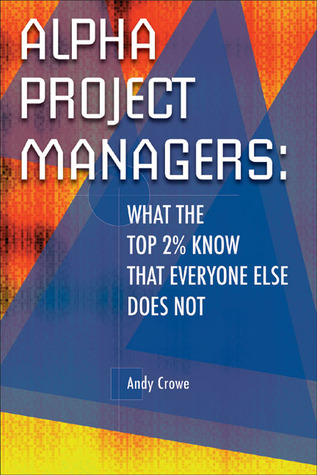 This book Crowe surveyed over 3,000 project managers and their co-workers/supervisors in order to identify the "top 2%" of project managers ("alpha project managers"). In the first cut he narrowed this down to 860 and finally identified the 2% or eighteen Alphas. He then attempted to discover what made these Alphas the absolute top of their profession. This book provides valuable details on the specific attitudes, basic beliefs, habits and practices that contribute to the success and excellence of these Alphas. One finding that surprised me was that seemingly minor habits of a project manager have a major impact on the project he/she leads. "Small differences in behavior and practices can account for large outcomes, both actual and perceived". I particularly appreciated the message towards senior managers - as projects are the engine of any organisation-. Project managers efficiency and project success can be improved by providing an environment that values project management and by implementing well-defined methodologies. I recommend this title. It's not a lengthy read but it stimulates a lot of thinking for the short time invested in it. Here's another book which would have made a decent set of presentation slides (and a short one at that). A survey was done of ~1000 project managers, their reports, their managers and key stakeholders; effectively the PMs were given 360 degree rating and self ratings in various criteria, and this book summarises the results. What do we find? The reader will undoubtedly be shocked to learn that the "Alpha" PMs are the ones that plan more, communicate better, lead better. Who would've thought it? It' Here's another book which would have made a decent set of presentation slides (and a short one at that). Best practices from real project managers who are in the top of their field. Great knowledge in a short compendium of real world project issues and how highly effective PMs succeed in the top 2%. In the end it's noted that of all the attributes that separate the Alpha group from their peers, communication presents the most striking difference. Why? Simply said, because "the PM does not always have an accurate handle on his or her own communication skills or effectiveness." I've always heard that this is one of the best books to read as a PM. It is about as boring as readying a study on being a PM. Let me save you the time it takes to read. Spend twice as much time in the design phase and communicate more than you think you need. Then you will be an Alpha Project Manager. Good survey, statistical approach to understanding what factors lead to good project management. More of a report out on the survey than a full book. Quick read by very useful. Bought copies for all the PMs in my sphere of influence. Good for newbies to the topic or someone who needs a reminder about how important communication is for project management. Heartily recommended, especially for those involved in project management. Plenty of practical insight which provides valuable perspective for the aspiring Alphas. This is a very quick read. But it has great suggestions for those who want to excel as a PM. I recommend all of Andy Crowe's Books. Andy Crowe is the CEO and founder of Velociteach and author of the world-famous book The PMP Exam: How To Pass On Your First Try as well as Alpha Project Managers: What the Top 2% Know that Everyone Else Does Not and The PMI-ACP Exam: How to Pass on Your First Try. He is one of a handful of project management authors whose titles have sold over 250,000 copies. He served as project manager for seve Andy Crowe is the CEO and founder of Velociteach and author of the world-famous book The PMP Exam: How To Pass On Your First Try as well as Alpha Project Managers: What the Top 2% Know that Everyone Else Does Not and The PMI-ACP Exam: How to Pass on Your First Try. He is one of a handful of project management authors whose titles have sold over 250,000 copies. He served as project manager for several high-profile international projects, including the creation of Europe's largest e-commerce site and was a member of Microsoft's DNA and .NET Advisory Committees. Andy is a Project Management Professional (PMP), a Program Management Professional (PgMP), an Agile Certified Practitioner (PMI-ACP), and a Six Sigma Black Belt. He makes his home in north Georgia.